If you have been reading my blog for a while you will recognize this quilt. It was my free BOM for 2011-12, the Vintage Sampler Quilt. This version features 30 of the original 42 blocks done in 30's fabric. 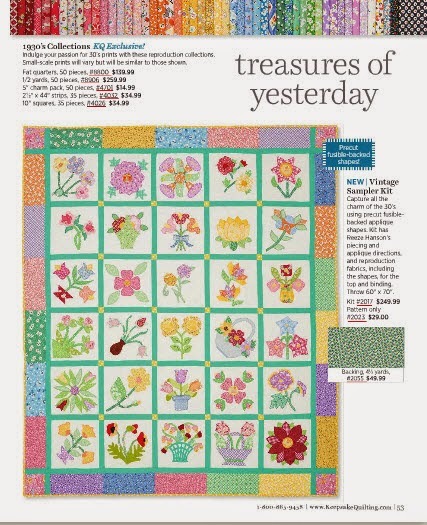 And Keepsake Quilting is offering it as both a pattern and a laser cut kit!! WOW. Take a look at page 53 when you get your issue. My sincere thanks to Faith who made the quilt, Christy who quilted it, and Jo Hellberg who chose to include it in the catalog. It's good! Congratulations! With this blanket began my acquaintance with you. Thanks Leka, I have so enjoyed our friendship over the last years. It is inspiring to see your incredible work, and I look forward to more enjoyable years of friendship. Congratulations Reeze. Quite an accomplishment. I really is a great pattern. thanks Robin. I so appreciate your comment. So happy for your success Reeze! Looks like second career will be a roaring success as well! So now we can all say "we knew you when....." Congratulations! HaHa, thanks Jennifer. No way to get a big head in this industry. Just when you get one success you get three "no thank you's". But I am so pleased that this BOM has been well received. Congratulations Reeze. I am still working on mine from your blog. I have about a dozen left to stitch and then put it all together. It was a fantastic BOM to follow. Thanks for the wonderful patterns, and your time. Oh Edie, I can't wait to see your blocks! Please send me a picture. i love seeing what you do with them. Blog Hop Starts Today . . . um er. . .Yesterday!